This document introduces you to tools for downloading data from each of the pollution, wind and temperature measuring stations in the Zona Metropolitana del Valle de México (greater Mexico City). get_station_data and get_station_month_data download pollution, wind and temperature data for each of the measuring stations in the original units (ppb, µg/m³, etc). get_latest_imeca download the latest pollution hourly maximums for each of the measuring stations. Because of limitations with the SEDEMA website http://www.aire.cdmx.gob.mx/ (where all data downloaded by the aire.zmvm comes from), options for each of the function aren’t entirely consistent but hopefully the following table will make them clearer. Pollution is monitored by a series of stations located throughout the Mexico City Metro Area. Since there are different pollutants to monitor, each measured in different units, and each with different specified averaging periods, a common scale called IMECA was created to make them comparable. If pollutants reach 151 IMECA points or more the Mexico City government can declare a phase I smog alert and order cars off the streets and place limits on polluting industries. On May 4, 2018 there was a smog alert, but there wasn no doble hoy no circula because metereological conditions were forecast to improve the next day. We’ll show just how easy it is to make a map of pollution levels during the alert with this package. The package also includes a data.frame named stations that includes the latitude and longitude of all pollution measuring stations. 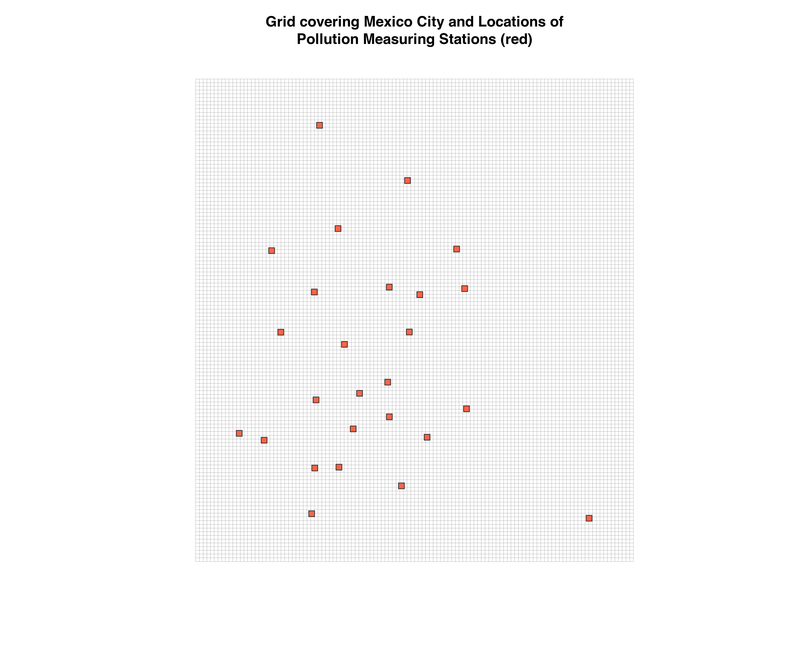 We will use this data to create a grid covering Mexico City and extrapolate the pollution values to each cell in the grid by inverse distance weighting from the locations of the measuring stations. 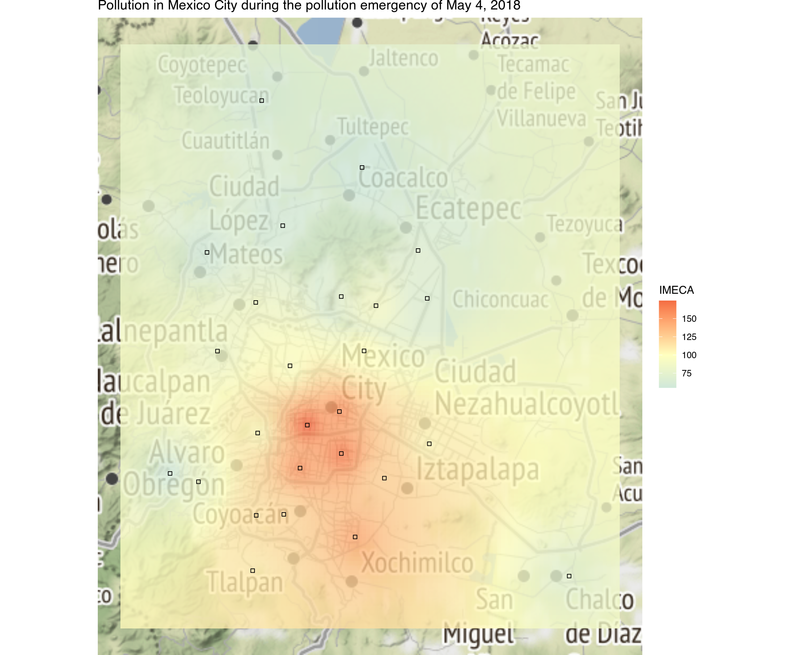 There are probably additive or interaction effects between pollutants, but to keep things simple we’ll do like the Mexico City government when it reports pollution levels and simply ignore them. We’ll take the maximum pollution value in each cell of the grid to create the map.